Twitter has from end of july introduced friend suggestions, to make you able to know and follow more friends in your timeline. If you are a twitter user am sure you have noticed this for two days now. This new development will see you getting more followers as has been in the case in facebook. Friend suggestion has been on for long in facebook and is based on the users you share one or more friends with. I noticed this two days ago and went ahead following @xyzshow and @wamathai who i thought i was following, but was indeed following @wamathaitheblog. Twitter made this announcement via their blog claiming that you will be able to even hide those you do not wish to follow. In addition, you will begin to see recommendations for similar users when you view another account’s profile. If you’re interested in a particular user, you might be interested in these other accounts as well. 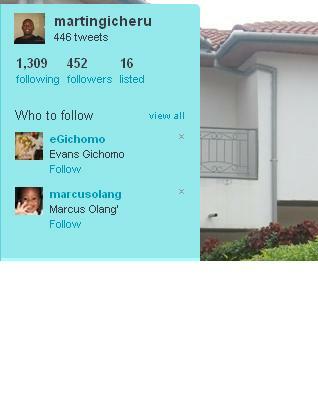 You will also be able to view more and get other categories of twitter users based on the industry they are in. Like for example, techweez is in the tech industry, so i will be tempted to follow twitter users in the technology category. Happy following!! Previous articleImportance of Internet Marketing for your Online Business!